I really can't get enough of that Louisiana sound really love it to bits. Here's another rarity from the Crescent City by Cookie Gabriel. The uptempo side is one of those slinky, funky little numbers that was so "in" at the start of the 60s. Think "pop eye". But the ballad No Love Sweeter Than Mine is the side for this website. This is another of those songs on the edge between swamp pop and deep soul. Plodding beat, climbing horns and some lovely NOLA piano (who is this? James Booker?) 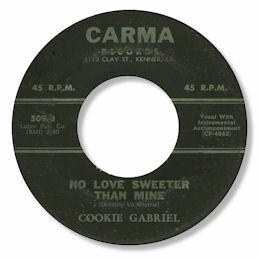 proved a classic backing for Cookie's rather charming "little girl" vocals. Lovely. UPDATE ~ My friend Greg Burgess has pointed me in the direction of the Folkways LP "Roots: The Rock And Roll Sound Of Louisiana and Mississippi" and when I took it off the shelves lo and behold there were two tracks by Cookie (now in the discography) which may not have been issued in the 60s. 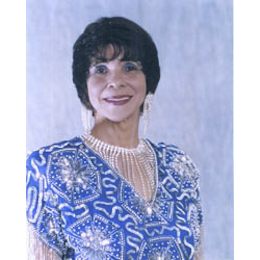 Davie Gordon writes with a link to an obituary for Cookie which you can find here. Very sad to learn of her passing but she certainly had a full musical life I'm pleased to say. I'm grateful to both writers. Note ~ Folkways LP "Roots: The Rock And Roll Sound Of Louisiana and Mississippi" has two Cookie Gabriel tracks "I'll Never Fall In Love Again" and "Look Out".